More power. More range. More style. That’s what the Okinawa Praise promised to bring to the table. Does it deliver the goods? We find out. Convention is a good thing. Sometimes. There’s an oddly pleasing familiarity about some things that makes life easier and, to some extent, predictable. And in that is a weird sort of satisfaction that manifests itself as happiness, in that moment, maybe more. When making something aimed at changing what is essentially convention, it should go without saying that other factors that would directly affect its adoption would need to be, well, conventional. 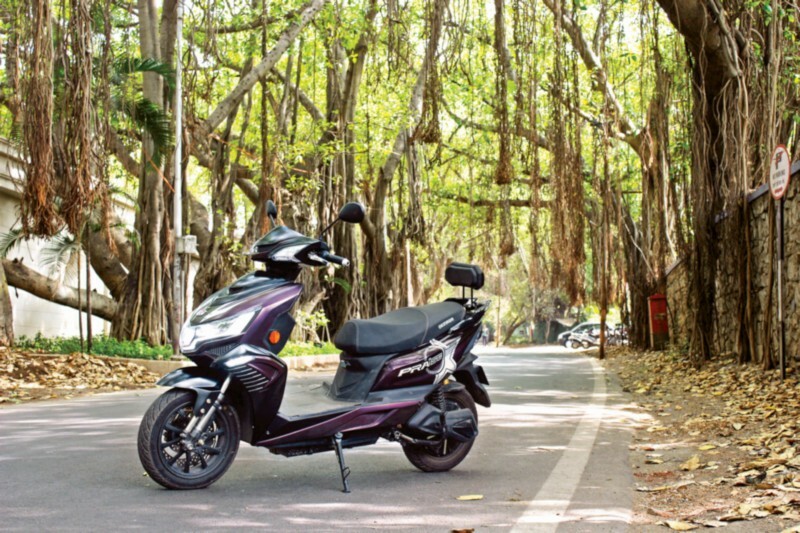 This might not be the case or point of view for some, but when it comes to electric scooters, I believe it’s best to change the one thing that makes the most difference — the motor — while leaving other important things — brakes, suspension, switchgear and, in general, ergonomics — as they are. This would, in my head at least, make the transition from a petrol-powered scooter to an electric one that much more seamless. Okinawa aren’t a new name any more. They have had the Ridge for a while, an electric scoot we rode last year, and which impressed us with its abilities in “Sport” mode. Abilities which were, sadly, as short-lived as its charge level. Nothing a recharge wouldn’t fix. This new one, though, the Praise, is somewhat of an odder ball. It’s more powerful, it has “dual front disc brakes”, and a claimed range of up to 200 kilometres on a single charge. Alrightey, then. The first thing that immediately ticked me off was the lack of instruction. 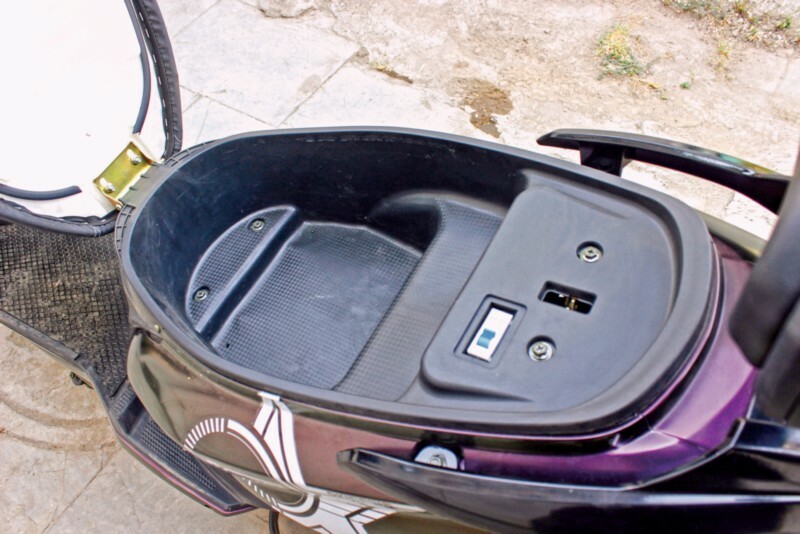 Now, the Ridge has a fuse switch below the seat that needs to be turned on before you can power on the scoot and get going. I assumed this one did, too. However, there was no sticker, label or manual letting me know how to get the seat open. After I, and then some of my colleagues, had spent a few minutes trying to look for a seat opening key slot, in vain, a call to the Okinawa folk made it clear: turn the key to the “On” position, then quickly turn it to the left. Right. “Click”. Seat opened. Fuse turned on. Key back in original slot. Time to go. While that may sound like a negative, because it is, there are some redeeming features. The styling is truly modern and rather dazzling. The bold front face, with the LED-laden headlamp unit and flowing lines, looks like an alien spacecraft. The mix of black plastic elements provides a good contrast to the available colours; this one’s purple. The seat is wide enough and can comfortably seat two. Yet, and this is what bothers me, the switchgear, though better than the Ridge in terms of placement and accessibility, still isn’t pleasingly symmetric. The horn and turn-indicator switch are now within thumb’s reach without having to let go of the left bar. However, the horn is above the indicator switch — unconventional. Conversely, the right side has headlamp controls in the conventional spot, the middle, and below it — where the electric starter would usually be — is, can you guess it? Another horn button. Right. Again, this one doesn’t have a start button, just turn the key and it’s ready to go. As with the Ridge, there are two riding modes: Eco and Sport. Eco is the easygoing one with top speed limited to about 40 km/h. Sport allows for slightly quicker acceleration and a higher top speed of around 60 km/h. This is more than okay for a 1.0-kW electric motor (that’s 1.36 PS) with a reasonable amount of torque. I say “reasonable” because the official figure remains undisclosed. The peak output is 2.5 kW (3.4 PS), accessible higher up. Technically, the Okinawa Praise has a third mode, Turbo, which is activated using the little green button below the left switchgear. It acts like — wait for it — the “Overboost” button on a Porsche 911 Turbo S. When pushed at full, um, throttle in Sport mode, when you would probably be doing about 60 km/h, it allows the Praise to reach a claimed 75 km/h. What it managed was an indicated 40 km/h in Eco mode, close to 70 in Sport, and slightly more — 74 km/h — in Turbo. However, our tests showed a true speed of 58.7 km/h in Sport, and 62.3 km/h with the Turbo button pushed. That’s okay for an electric. It is. Most people don’t buy electric scooters to win drag races, do they? Principal Correspondent at Bike India and Car India. Food for the body. Fuel for the soul. 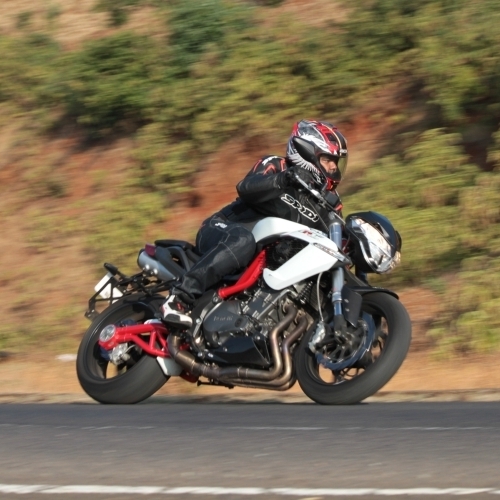 Jim Gorde – who has written 302 posts on Bike India.